Kann ich im Busen heisse Wünsche tragen (Can I Carry Hot Desires in My Heart? ), composed in early summer 1902, is dedicated to the alto Pauline de Haan-Manifarges. Several weeks after its publication in October 1905 she performed the song in public. The text is a sonnet by Karoline von Günderrode (1780-1806), a German poet whose philosophical poetry Diepenbrock admired. At the age of 26 this talented woman took her own life because of an impossible love affair. The emotionally charged sonnet Kann ich im Busen heisse Wünsche tragen reflects the mood of the young poet, torn between hope and death wish. In Diepenbrock’s song, written in E major, this conflict appears to be depicted by a continuous irresolution between major and minor, as demonstrated by the ambivalent character of the half-diminished seventh chord on words like “unbekränzt” (uncrowned, m. 6, 1st beat) and “trauernd” (mourning, m. 8, 1st beat). 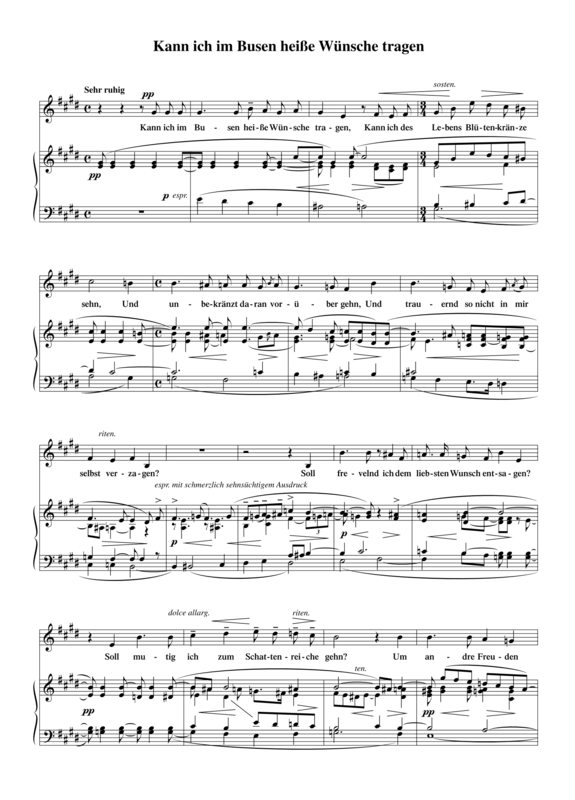 While the voice as it were recites the first hesitant line in a restrained manner (sehr ruhig and pp), the syncopation in the right hand of the piano reveals the inner unrest. On the ‘Seufzer’ (minor second) that colours the short interludes, Diepenbrock has notated: mit schmerzlich sehnsüchtigem Ausdruck (with painful longing expression). When in the first tercet Günderrode mentions descending to the realm of Pluto (in Roman mythology the god of the underworld), where the passion of love is found to burn even in the darkness, Diepenbrock unfolds – allmählich belebter und breiter – a completely different musical structure, with an ascending melody and a continuous crescendo that culminates in a powerful top note in the voice. Now the text is set to broad vocal lines, against a restless accompaniment that constantly fans out from low to high. In the last strophe there is a reference to the beginning of the song. Then in the postlude the motive of “des Lebens Blütenkränze” (the flower wreaths of life, see m. 4) returns, this time over an organ point on e in the bass. The ‘Seufzer’ dominates the last measures of the song. In 1907 Diepenbrock made a setup for the orchestration of Kann ich im Busen, but he gave up after one page (see RC 76*). 18 okt 1903: Eerste uitvoering van Kann ich im Busen heisse Wünsche tragen door Pauline de Haan-Manifarges met pianobegeleiding van A. van Olden-van Delden op het middagconcert in Musis Sacrum te Arnhem. Voor de pauze vindt de eerste uitvoering plaats van Sulamith voor soli, koor en orkest van Jan van Gilse (onder leiding van de componist), voorafgegaan door de ouverture Le carnaval romain van Berlioz, gedirigeerd door J. Martin S. Heuckeroth. Na de pauze zingt Pauline de Haan-Manifarges – behalve Diepenbrocks lied – Winterweihe van Richard Strauss, waarna mevr. van Olden-van Delden pianostukken van Brahms, Chopin en Liszt speelt; Johannes Messchaert besluit het concert met een vijftal liederen van Schumann. Mevrouw de Haan bood in superieure interpretatie een voorname maar ietwat koele verklanking van een liefdessonnet door Diepenbrock, die anders juist in heilige extase zijn heerlijkste kunst geeft, en een warm, innig lied van Strauss, die anders in toenemende mate door zijn reusachtig esprit beheerscht wordt en zich daarbij meer en meer doet kennen als “der Geist der stets verneint” — het was wel eigenaardig! Mevr. 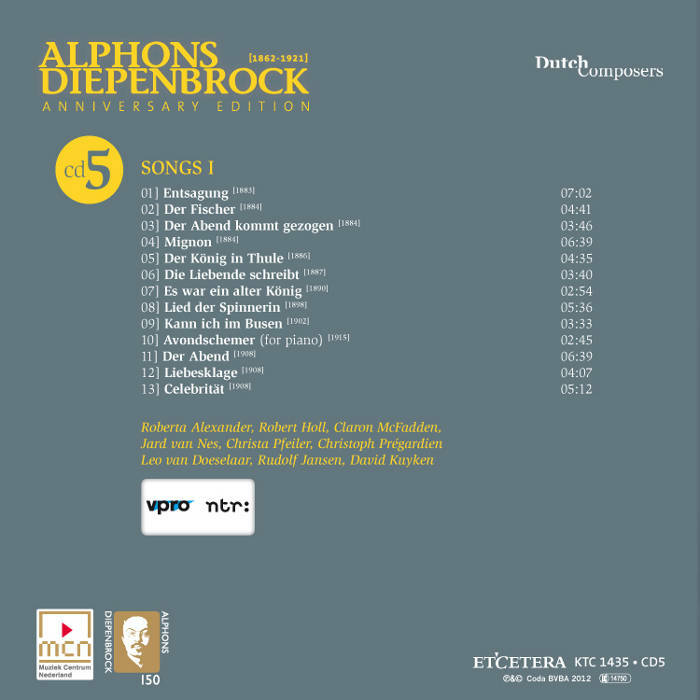 de Haan-Manifarges was, behalve een paar malen te hoog intoneeren in Diepenbrock's harmonisch interessante sonnet Kann ich im Busen heisse Wünsche tragen en Strauss' prachtvolle Winterweihe, uitnemend.